If you’ve never been to Bangkok before, you probably come with lots of preconceived ideas like I did, both positive and negative, about what Bangkok is like: golden temples, raucous nightlife, drunk Aussie backpackers sporting cheap Chang beer t-shirts that they bought on Khaosan Road, shady tuk tuk drivers who try to take you to get fitted for an overpriced tailored suit that will fall apart once you arrive back home, cheap massages legitimate or otherwise, karaoke with sassy ladyboys, unspeakable acts involving ping pong balls and bananas, spicy street food, stifling heat, pollution and poverty. Yes, Bangkok is all of this and much more. It is a chaotic metropolis that assaults your senses, shocks and inspires, frustrates the hell out of you and calms your nerves. Bangkok was my introduction to Southeast Asia and, overall, I found it to be a perfect place to begin my journey on the Banana Pancake Trail. My first couple days there were on my own, but thereafter I joined up with a G Adventures tour. I decided to visit some temples on my first day in Bangkok. I took a boat up the Mae Nam Chao Phraya River from my hotel to Ko Ratanakosin. 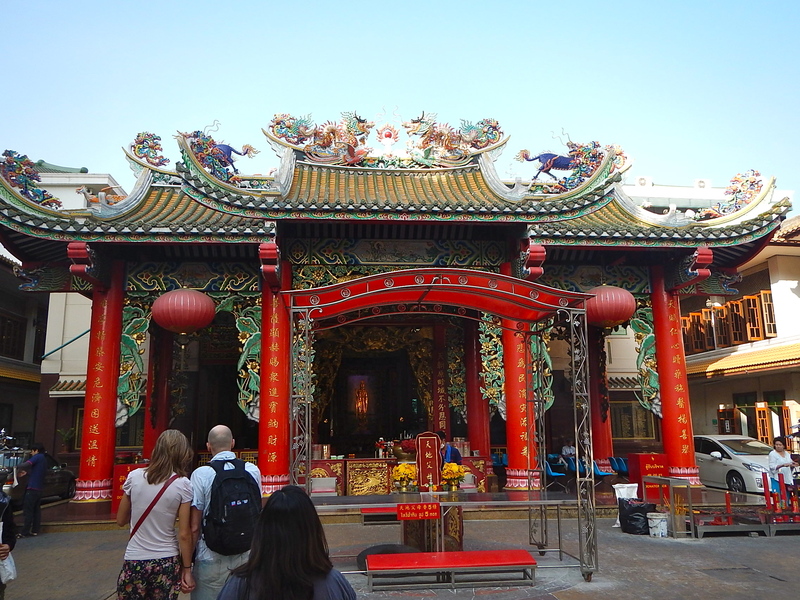 I visited the Wat Pho temple first. The temple dates from the sixteenth century. 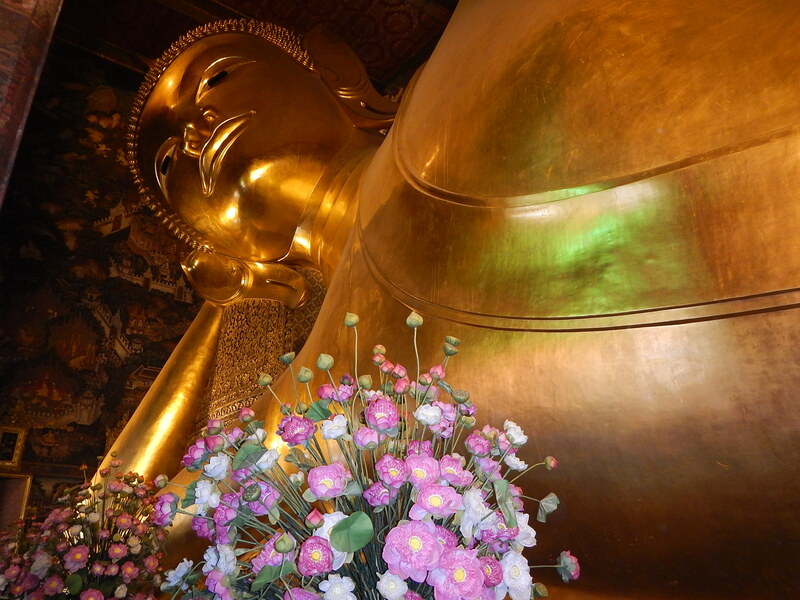 I entered the temple, took of my shoes (for the first of countless times in Southeast Asia) and walked along the enormous statute of the reclining Buddha. The Buddha was really impressive, a little difficult to photograph with the crowds of tourists inside. The feet of the Buddha are intricately designed with mother of pearl. After exiting the temple, I wandered through the large complex of smaller temples and stupas. Wat Pho is known for its massage school, so I decided to get a half hour Thai massage. They really bend you like a pretzel, cracking and manipulating your body into all kinds of contortions, but definitely leaving you feeling great afterwards. 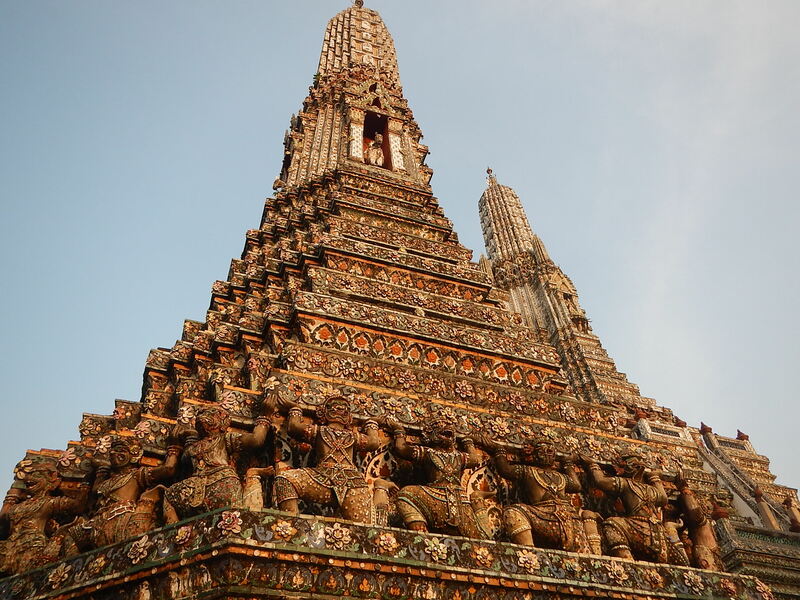 After visiting Wat Pho, I crossed the river on a ferry boat to Wat Arun. The towering structure overlooking the river is named after the Indian god of the dawn, Aruna. The tower has steep stairs taking you to two levels. The higher levels are blocked off, presumably because they are too dangerous to climb. The tower has porcelain gargoyle-like creatures making up its structure and seemingly holding up the higher levels. After crossing back across the river from Wat Arun, I noticed that the line to board the ferry boat was rather long. I ate at the restaurant nearby, helped a French tourist speak to his hotel (his English wasn’t so great), and watched the boats go by. I tipped the waitress, and after doing so, the waitress aggressively demanded a tip from the French tourist as well. 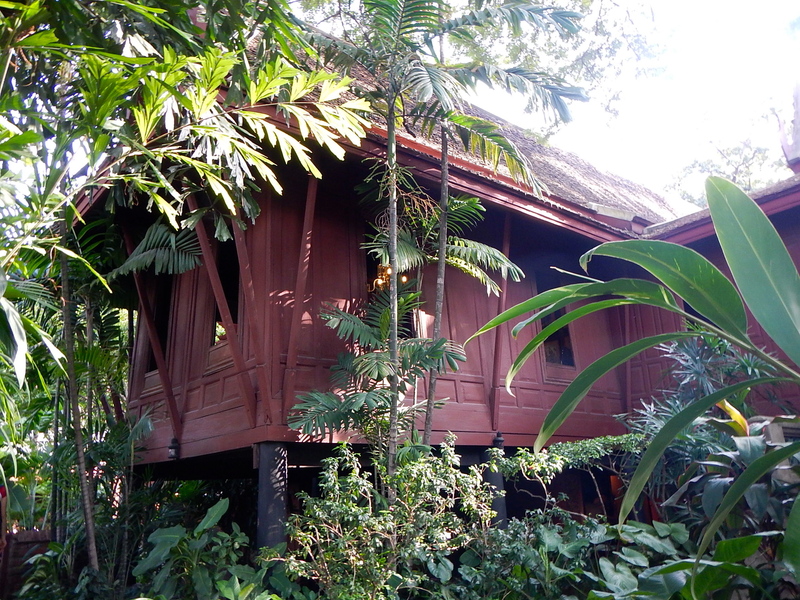 The Jim Thompson House is tucked away down a narrow street and faces one of the city’s canals. Jim Thompson was an American entrepreneur who came to Thailand and assisted Thailand in developing its silk trade. He ended up collecting lots of works of Asian art and sculpture which are displayed throughout the house, a work of art itself, a combination of teak structures that he collected from around the city of Bangkok. The outside areas are covered with lovely manicured gardens. Jim Thompson disappeared in the Cameron Highlands of Malaysia in 1967 and his disappearance was one of the most well known in Southeast Asia. Conflicting theories about his appearance abound. 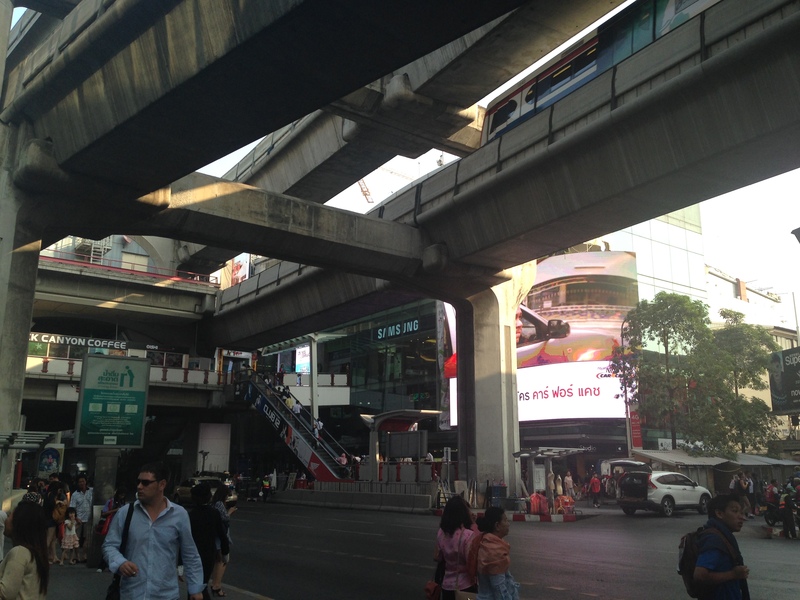 Part of the experience of hyperactive Bangkok is to walk through some of the crowded shopping centers, which are actually not that much different from shopping malls that you would find in the United States or other Western countries, but there is something about this area, its concrete overpasses and hordes of people, that make this a unique experience. Street food in Bangkok is something you really shouldn’t miss. Don’t be too afraid of it, although there are some general rules you should follow. Just go up to a busy vendor and if it looks and smells good, try it out. It does help if you have a tour guide with you so you know exactly what you are putting in your mouth, but if you don’t have lots of dietary restrictions, trying the different foods is a fun and inexpensive way to get your nourishment while out touring the busy streets of Bangkok. While I didn’t get to experience too much of Bangkok’s notorious nightlife while I was there, I did get to visit the Sirocco bar at the top of the Lebua Hotel. This location was used in the movie The Hangover 2. The views from the top are incredible, but the drinks are very expensive, probably the most expensive I saw anywhere in Southeast Asia. If you’re a fan of the Hangover movie, you should definitely check this place out. Chinatown is a labyrinth of streets and alleys with vendors selling all sorts of goods, exotic foods, garments, textiles, any electronic part you can imagine and more. I was glad I had a tour guide to help navigate through this confusing, yet fascinating neighborhood of Bangkok. Chinese traders have had a long history in Thailand and this particular neighborhood dates back to 1891. 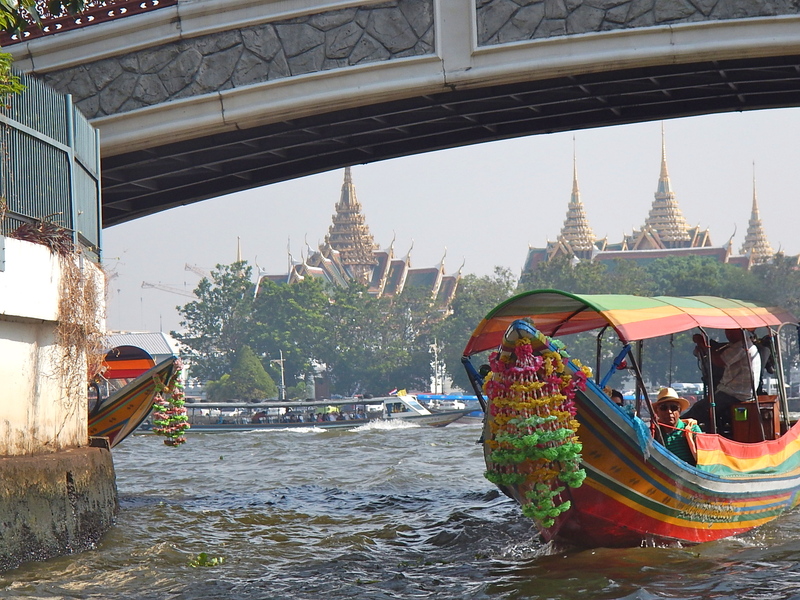 Riding a boat through the murky rivers of Bangkok is a quintessential Thailand experience. I recalled the chase scene from the James Bond movie The Man With The Golden Gun and the narrow boats propelled by a rotor that the driver puts in the water. People live right along the rivers edges in residences both stately and impoverished. Some of the homes look so poorly constructed that they are about to fall into the river. Here and there, you might also see a huge dragon-like monitor lizard lazing about in the sun. Floating vendors often approach boats carrying Western-looking tourists to hawk their wares. Overall, the boat ride offered unforgettable memories of Bangkok. The Grand Palace, official residence of the King of Thailand since 1782, is an impressive complex of temples and buildings. Outstanding is the Wat Phra Kaew complex which houses the Temple of the Emerald Buddha, perhaps the most sacred Buddhist temple in Thailand. This area of the palace grounds also includes a reproduction of Cambodia’s Angkor Wat. The Grand Palace keeps a strict dress code. Shorts and other revealing clothing are not permitted. If you are not properly attired, you might get yelled at by a short yet aggressive Thai woman near the entrance, affectionately referred to as the “Fashion Police.” If you don’t have the proper attire you can rent clothes from the palace. 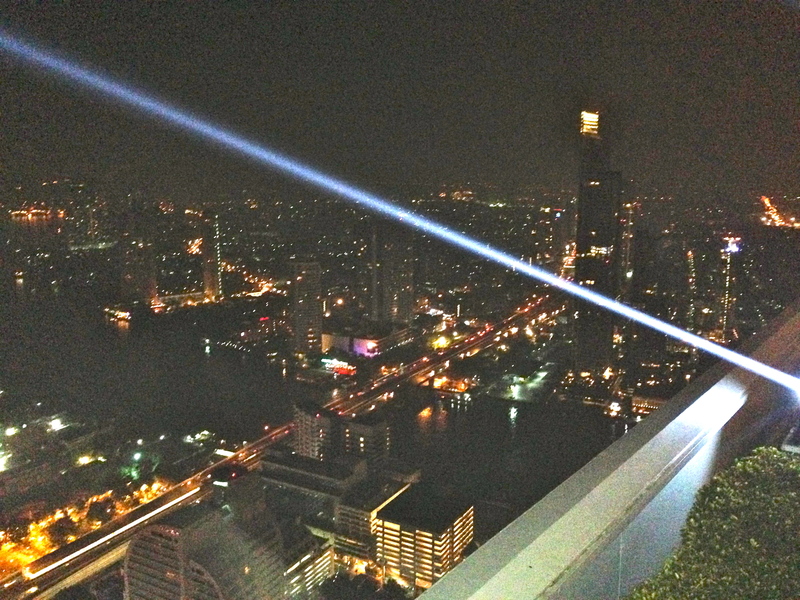 I was in Bangkok around Christmas of 2013. At the time, there were protests against the Shinawatra government in an area close to Khoasan Road. Walking back from the Grand Palace trying to find some other points of interest, I ended up walking through the protest grounds with another traveler on my tour. I knew that protests were taking place in the city, but it didn’t really strike me that we had stumbled upon the protest until we were in the middle of it. I think I was expecting people to be shouting, carrying signs, etc., but the protest was more like a festival or concert with music, vendors selling t-shirts with the Thai flag and people sitting around socializing. Unfortunately, before and since this time, the government has responded to these protests with violence. However, when I went, everything was peaceful. 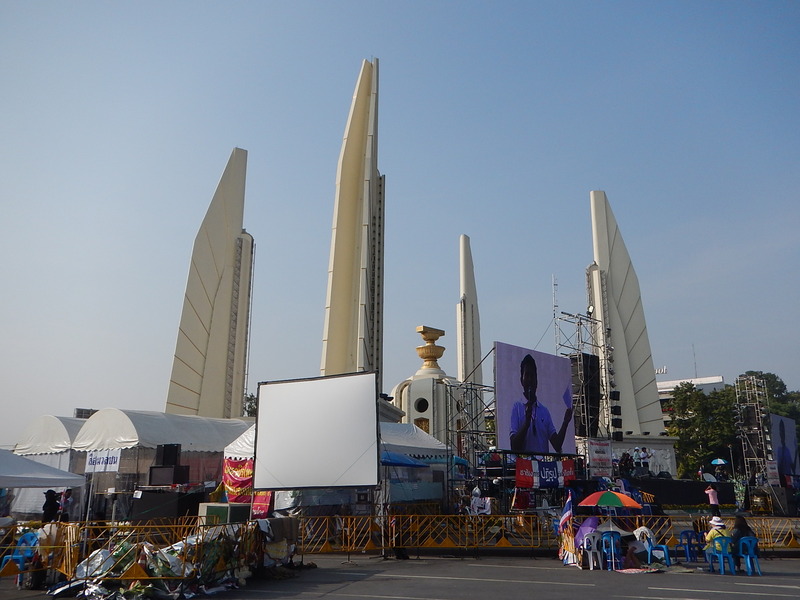 At the time of this post, demonstrations continue in Bangkok as well as government crackdowns. In spite of my uneventful experience, I do not recommend that travelers purposefully try to seek out the protest grounds. 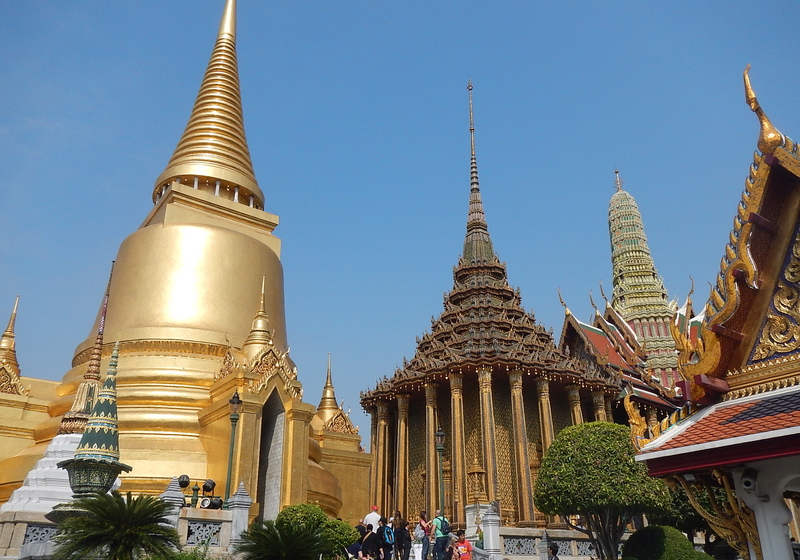 If you are traveling to Bangkok and are concerned about political unrest, travel blogger Richard Barrow often posts helpful information on what areas of the city you may want to avoid and general reporting about what is going on in the city. 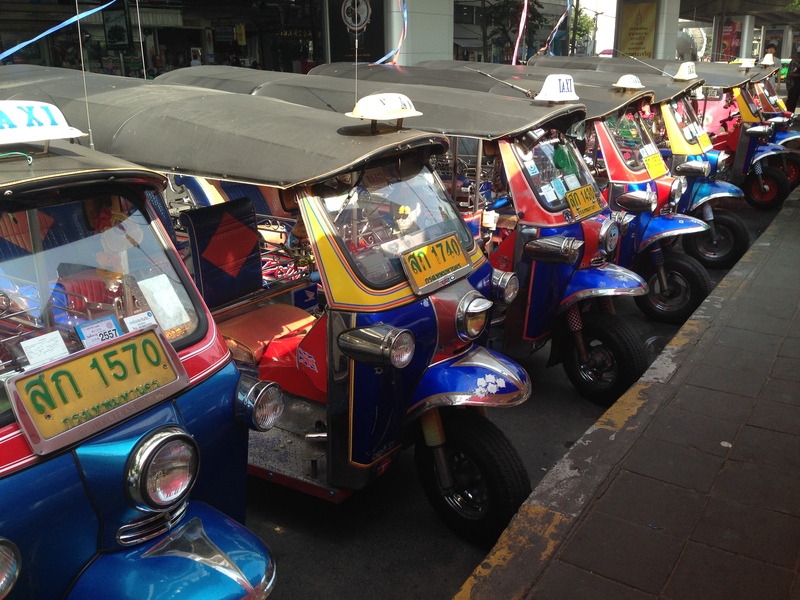 Some people say that Bangkok is a city that Western tourists either love or hate. My experience was definitely more on the side of love. It was my very first time in a non-Western country and I was intrigued by the culture, the food, the and the history. There was definitely more that I wanted to experience there, and unfortunately, I decided not to return there because my travel schedule would have put me there around the elections that were held in early February 2014 and the possible political instability. It probably would have turned out all right. Hopefully, I will get the chance to return someday. Have you been to Bangkok recently? What were your favorite experiences there? 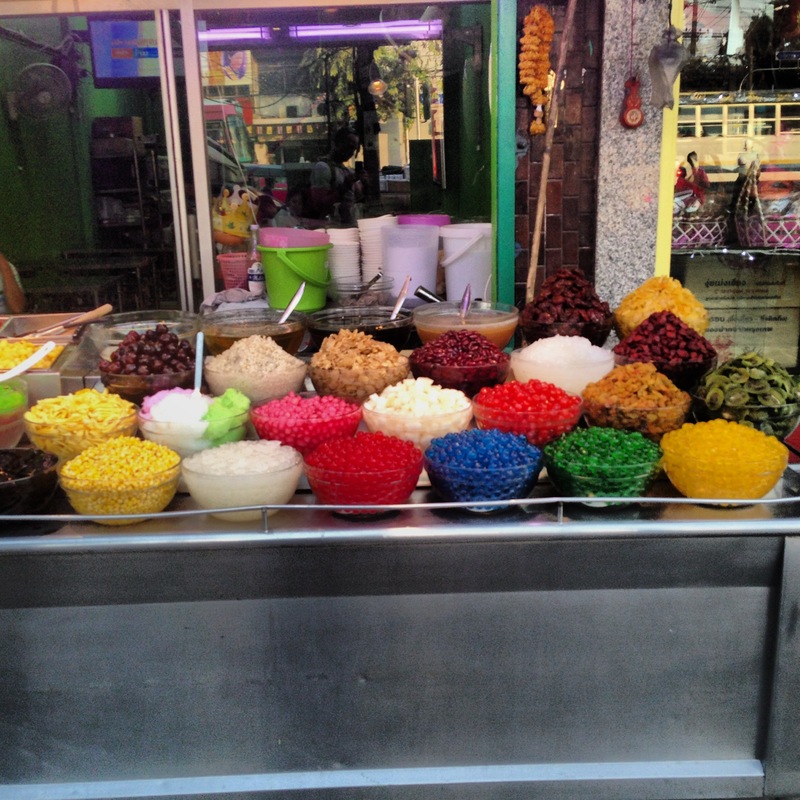 Hi Jeff – thanks for linking to our ‘how to eat street food safely’ post. I hope it was helpful. Pleased to see you’re a Bangkok lover. My photographer husband and I lived there on and off for years and fell in love. It can drive us crazy at times – namely the traffic – but there are ways of avoiding that (most of the time) by staying close to a BTS line. Now we’re living in sleepy Siem Reap in Cambodia we only get back to Bangkok every few months for work, I think we appreciate it more. Let us know if you get to Cambodia.